The number of people killed in bicycle accidents here last year rose 11.5 percent from a year ago, apparently due to an increasing number of elderly cyclists and riders not wearing protective gear. From 2013 to 2017, the number of accidents involving bicycles came to 28,739, while 540 bicycle riders died in accidents and 30,357 others sustained injuries. The number jumped from 4,249 in 2013 to 6,920 in 2015, then dropped to 5,659 in 2017. 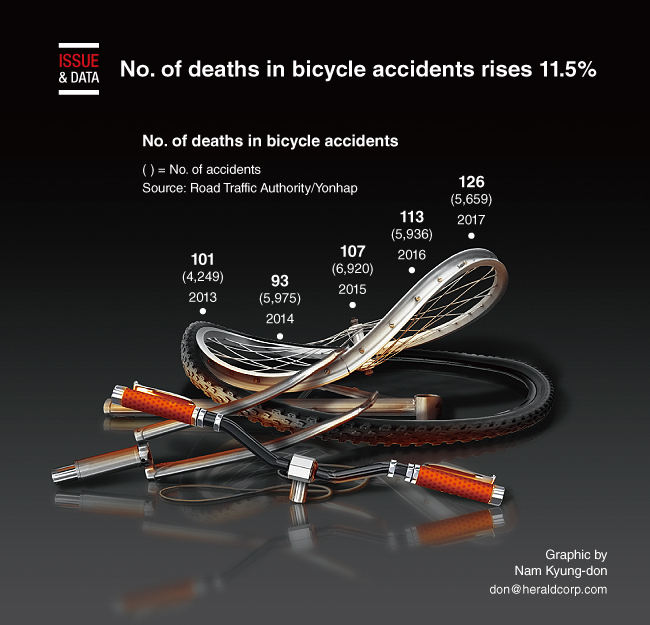 However, the number of bicycle accident deaths decreased slightly from 101 in 2013 to 93 in 2014, and then rose steadily to mark 126 in 2017.